Welcome to the Rain Bird online Point Source Emitter Calculation Tool. By answering the following questions, this tool will calculate the Daily Plant Water Requirement (PWR), provide you with the number of emitters required to irrigate each individual plant, and the suggest the run time for your point source drip irrigation project. 1. 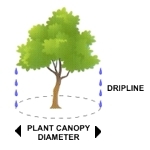 What is the diameter of the plant canopy?